This month’s PSQI Online Spotlight looks at the lessons an Indiana hospital learned from a ransomware attack. There are new additions to this year’s list, including retained surgical items and patient lift systems. Several experts discuss the top 10 issues and about steps that can be taken to prevent them to guide readers in the upcoming year. With 2019 on the horizon, it makes sense to offer up some health IT (HIT) predictions. What’s the harm? If I am correct, the HIT community will praise my ability to critically think and predict the future. If I am miserably wrong, no one will care. So here goes. By facilitating real-time connections and information sharing among caregivers, they help resolve some of healthcare’s most intractable, harmful, and costly problems: communication failures, delays, and errors. Telehealth, as defined by the Health Resources Services Administration, is the use of electronic information and telecommunications technologies to support long distance clinical health care, patient and professional health-related education, public health and health administration. Minimally invasive surgery, from a safety perspective, has been shown to result in shorter hospital stays, faster healing times, and cosmetic benefits associated with less significant scarring. 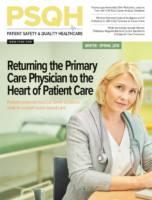 To overcome the issues plaguing care coordination between PCPs and specialists, PCPs must embrace tools and resources that extend their clinical domain without delegating patient care. Ranked by which risks should receive the highest priority, the list compiled by ECRI’s Health Devices Group positions the threat of hackers targeting remote access to healthcare systems as the most pressing. In this Q&A, Austin O’Connell of Philips Healthcare discusses the newest imaging technology, as well as how hospitals create a value proposition for safety and quality that resonates on the floor of the radiology department and in the boardroom.